Officially, my new spinning wheel is in the mail! I have recently discovered that there are many knitting techniques I have yet to try and would like to learn. When I realised Dad’s birthday was fast approaching, I decided to find a way of learning some new things without the addition of a ton of knitting. I stumbled on brooklyntweed’s Alberta. The only problem was it was published in Wild Fibers Magazine’s 5th Anniversary Issue. How in the tarnation was I to get my hands on that? Enter ingenuity on the part of a close friend: Call the LYS! Thankfully, with one last copy to spare, I was able to procure the magazine. Not only will I be getting a subscription to the magazine for my birthday from my loving husband, M. – but I have finally found a wonderful read to satisfy my constant need to a.) read about other parts of the world, and b.) consistently be surrounded by what I love most in this world: fibre. I thought goats in a tree was odd, but flying sheep? Wonderful! When we had first walked into the festival, I had beelined it straight for this yarn but I made a promise to M. that I would not buy any more yarn until I worked through my stash (especially since I was planning on purchasing a wheel, which means roving). I am very jealous L. bought this yarn but I know she is going to do absolutely beautiful things with it – I’ve seen the pattern. It’ll be amazing. 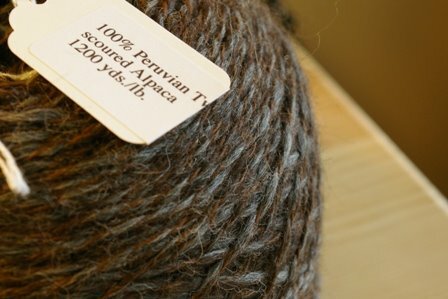 I wanted to share the fibre though as it is so wonderful – the brown and blue just compliments like nothing else!